Switzerland - IOM is to launch a Global Migration Film Festival, the first of its kind, which will pay tribute to the many films that capture the beauty and challenges of migration – bringing these realities to audiences around the world. The launch will coincide with the observance of IOM’s 65th Anniversary, on December 5, and will roll out as a worldwide event with screenings in at least 50 countries. The Festival concludes on December 18, International Migrants Day. 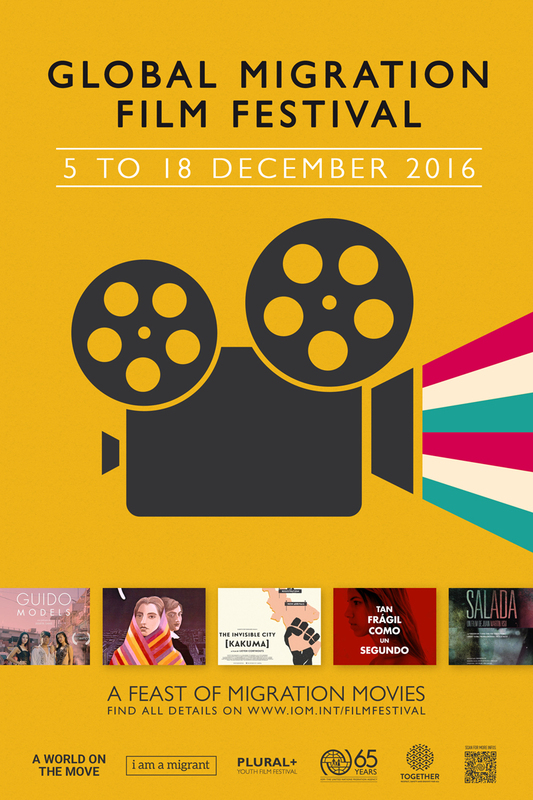 The festival’s format is unique: IOM is providing a menu of films for which IOM has secured screening rights open to any cinema society, university film club, café or theatre wishing to take part. Already some 75 IOM missions – nearly half of all IOM missions worldwide – have signed on to present films on local and international migration themes. IOM’s 165 offices have been asked to seek out contemporary and vintage films that speak to the migrant experience, with an emphasis on works filmed in the native languages of the missions’ locations. Among the titles being screened will be one of Hollywood’s oldest migration genre films – The Immigrant (1917) starring Charlie Chaplin. Newer titles like “The Invisible City – Kakuma,” a documentary on Kenya’s sprawling refugee camp, will also be available for screenings worldwide. Admissions will be free and screenings will be followed by IOM events on site. On December 6, IOM will open the festival at the Graduate Institute in Geneva with a screening of the 2013 film La Jaula de Oro (The Golden Cage) – a drama by Mexican director Diego Quemada-Diez chronicling the harrowing journey of three young Guatemalans seeking a new life in the United States. Luis Salinas, the producer of the film – which was released commercially in some markets under the title The Golden Dream – will take part in a panel discussion after the screening. Among those countries where IOM will screen feature films, shorts and documentaries are Afghanistan, Argentina, Australia, Austria, Bangladesh, Belgium, Bolivia, Brazil, Bulgaria, Burundi, Chile, China, Colombia, Congo, Costa Rica, Croatia, Cyprus, Czech Republic, Djibouti, Ecuador, Egypt, El Salvador, United Kingdom, Ethiopia, France, Guatemala, Honduras, Iraq, Ireland, Italy, Jamaica, Jordan, Kenya, Lithuania, Mauritania, Mexico, Netherlands, Nicaragua, Niger, Norway, Panama, Paraguay, Peru, Philippines, Poland, Portugal, Russia, South Africa, Switzerland and Zimbabwe. IOM Australia has selected as its venue the National Film and Sound Archive http://www.nfsa.gov.au/ to screen the popular Australian movie: Constance on the Edge http://constanceontheedge.com, which has been nominated best Australian movie in 2016. IOM’s office in Erbil, Iraq, the command center for a massive relief effort reaching over a million Iraqis caught between warring factions in the ongoing assault on Mosul, is also enthusiastically taking part in the festival. It will screen several Kurdish-language films at Janos’ Film Café in Erbil, the capital of Iraq’s Autonomous Kurdish Governorate from Thursday, December 8 – the start of the weekend – and continuing through December 15. “It means so much to us to be able to do this, in the midst of this emergency. It says a lot about all of our efforts to restore stability and a positive outlook for people here as they look to the future,” said IOM Erbil head of office Barbara Rijks, who helped choose the films. The Global Migration Film Festival supports the global United Nations campaign “Together”, which aims to change perceptions and attitudes towards refugees and migrants. Many of the films will be shown at United Nations Information Centers (UNIC), as well as at other UN facilities such as the UN office in Geneva (UNOG), which will host lunchtime screenings over 3 days in December.